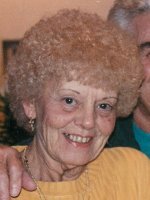 COLONIE-Gladys E. Galeo, 88, of Colonie, passed away peacefully on Saturday morning at Daughters of Sarah Nursing Home surrounded by her loving family. She was born in Albany and was the daughter of the late Fred and Mary McNaley Lavery. Gladys had worked as a bank teller and for Nationwide Insurance years ago. She enjoyed traveling and playing bingo. Her most treasured time was caring for her adored grandchildren. She is survived by her beloved husband of 70 years, Michael S. Galeo Sr. Gladys is the devoted mother of Michael S. (Susan) Galeo Jr., Joseph (Lisa) Galeo and the late Linda Galeo Miller. Gladys is the sister of Helen Lavery, the last of the seven Lavery siblings. She is the cherished grandmother of Paul (Diane) Miller Jr., Kelly Livingston, Cheri Van Ness, Christine (Kevin) O’Connell, Dana Galeo and Lynsey Lawson. She is the loving Nanny of Kristine and Mikey Livingston, Zach and Alex Miller, Bobby and Christopher Van Ness, Aliyah and Ashon Wright. She is also survived by several nieces and nephews. Relatives and friends are invited to attend the Mass of Christian Burial on Wednesday evening at 6:00 at Christ Our Light Catholic Church, 1 Maria Drive, Loudonville. A celebration of life will follow the Mass. Memorial contributions may be made to the Alzheimer’s Association of Northeastern NY, 4 Pine West Plaza #405, Albany, NY 12205 in memory of Gladys E. Galeo. To leave a message of condolence for the family, please visit www.HansFuneralHome.com .